The holidays usher in a combination of emotions — from joy and peace to stress and panic. Both sets of emotions, good or bad, can result in eating the most indulgent of holiday treats. Give your immune health a hand, and ditch the processed sugar this year! In a normal year, Americans are consuming 60 percent of their overall calories in highly-processed foods, and this means an overconsumption of processed sugar in things such as soda, cakes, and cookies. As obesity rates continue to increase, it might be attributed to the fact that one in three Americans drink a sugar-laden beverage daily, and also that the average American consumes 23 teaspoons of added sugar each day! The American Heart Association gives recommendations of no more than six teaspoons of sugar for women per day, and nine teaspoons for men. There is a disconnect between processed sugar and the detriment to our health and wellness that should be considered before reaching for that third cookie. 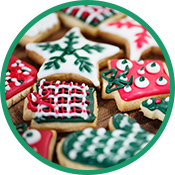 Consuming sweets can be rough when you struggle with blood sugar balance, and while it’s important to enjoy yourself in this season and celebrate, creating boundaries can help keep you healthy. You know yourself best, so create guides around how you respond to food triggers. Are you an all or nothing type? Or, do you work better in moderation? Try the 80/20 approach, and eat extremely clean and healthy 80 percent of your week and set aside 20 percent of the week to enjoy treats. Weight gain during and after the holidays is prevalent because sugar is not only in the treats we all know and love, but it’s also hidden in an abundance of unexpected places: salad dressings, spaghetti sauces, processed meats, sports drinks, and bread. 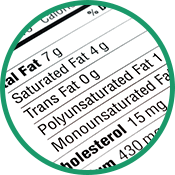 This holiday season, commit to reading labels and try not to consume processed sugar in your day-to-day meals. How do I limit my sugar consumption during the holidays? This was mentioned above, but once you start doing it, it’s quite eye opening. You’ll begin to see how much sugar is added to the usual and unusual suspects. When you’re reading the labels look at the serving size and the listed sugars in grams. One teaspoon of sugar is equal to 4.2 grams; keep in mind a majority of sodas on the market have over 35 grams, which would put both men and women over the recommended amount of sugar per day. Keep in mind that sugar goes by many names; including glucose, agave nectar, cane sugar, barley malt syrup, brown rice syrup, etc. It will commonly hide in breads, yogurts, and sauces, so read all your food nutrition labels. Many food items such as applesauce, dried cranberries, almond milk, soy milk, canned fruit, and oatmeal oftentimes are sweetened. Be sure to look for their unsweetened counterparts to avoid processed sugars. Spices are amazing for adding flavor to foods without using sweeteners. Incorporate cinnamon, cardamom, vanilla, clove, cocoa powder, ginger, and nutmeg into your recipes. If you’re doing holiday baking, cut back the amount of sugar you use in a recipe. If it calls for a cup, try half a cup. Or, if you’re baking with chocolate chips, find chips that have no added sugar or are sweetened with stevia. There is a little known biochemical anomaly when it comes to sugar consumption and vitamin C through what is known as competitive inhibition. Essentially, if you start to feel a tickle in your throat and start pounding vitamin C, while simultaneously consuming a good amount of sugar, you will need to increase your consumption of vitamin C. Here’s why: the two compounds closely resemble each other. When your body is fighting a cold or infection, white blood cells go out and fight whatever is out, perusing your body. Insulin then transports vitamin C to these cells so they can rid the body of the foreign entity. If sugar is more abundant than vitamin C, insulin will actually let sugar in before vitamin C! What this results in is a delayed immune response because of competitive inhibition. The takeaway is if you start to feel like you need immune support around the holidays, first ditch the sugar, and then supplement! There are many different vitamins, minerals, and phytonutrients that support healthy blood sugar balance, so try them out this holiday season! Chromium – This mineral is excellent for insulin functionality. Find it in brewer’s yeast, liver, grass fed beef, mussels, oysters, broccoli, and mushrooms. 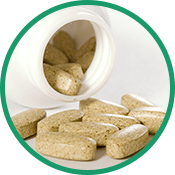 Magnesium – This mineral is great for blood sugar modulation and insulin functionality. Find it in nuts, seeds, dark leafy greens, oysters, shrimp, kelp, and avocado. 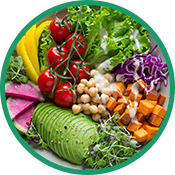 Fiber – Fiber is great because it helps modulate blood sugar by slowing the rate at which carbohydrates are digested, which also means a slower rate of glucose release in the bloodstream. Vegetables are a great source of fiber. We have an excellent product to help with all the blood sugar balancing throughout the holidays. 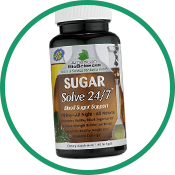 Try SUGARSolve 24/7 today.